In addition to rewrapping a tsuka for a recent client, I was also asked to replace the original tsuba with a new one, fitting it to the blade. 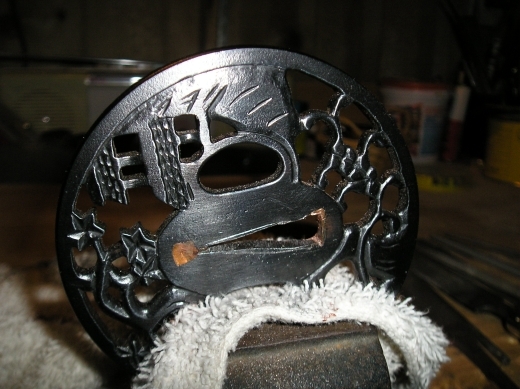 Below is a side-by-side before photo of the two tsuba, the oringinal on the left, and the new one on the right. 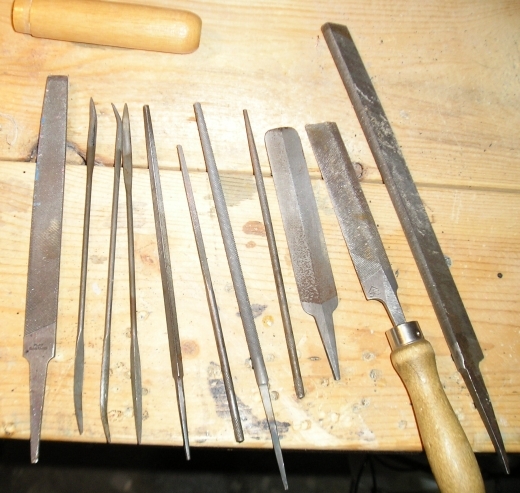 Fitting a new tsuba to a sword usually involves the widening or lengthening of the nakago-ana (opening for tang) to improve the fit, below is a photo of a few of the various file one might use in this process. After measuring the necessary height, width, and position of the nakago-ana, I marked or scratched an outline of the desired opening on the new tsuba. Below is a photo of the actual filing that was involved in the fitting. The next photo was taken midway through the process, notice the scratch lines defining the desired size and shape. 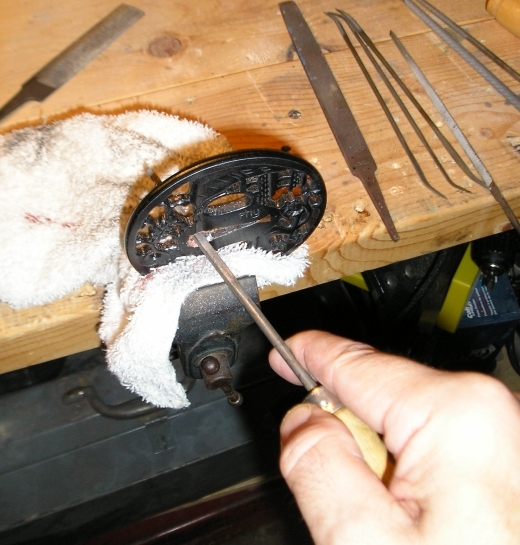 It is important to regularly check and recheck the fit and positioning of the tsuba on the nakago, and in relation to the saya, seppa, and fuchi. 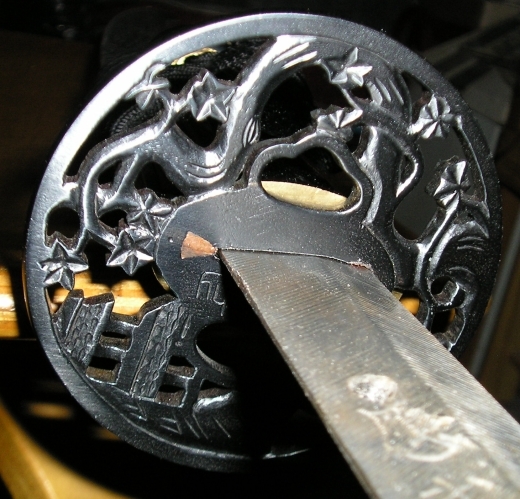 Below is a photo of the tsuba on the sword in its final fit, it is both lined up with the seppa and saya, and has a tight fit. 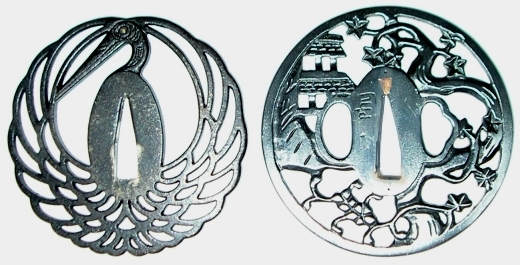 Below is a comparison shot of the original tsuba and the newly fitted tsuba. One of my "sword friends" in Sweden, Jonas Nordström, has been doing very nice tsuka and saya work for a number of years now. Recently, he shared with me, and consequently I am sharing with you, a finished restoration project he did on his Nine Circles Shinken "Oni". 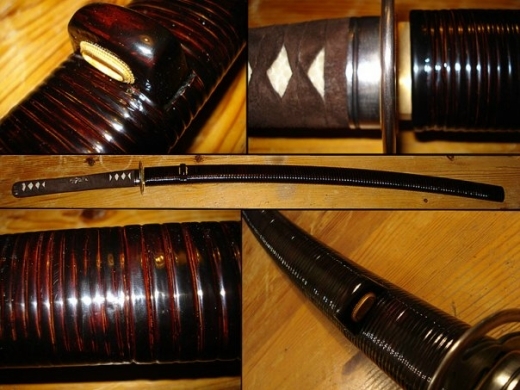 He wrapped the Saya with two different widths of Rattan. I like this look very much... Thanks Jonas!